If you are interested in donating a raffle prize or items for the swag bags, please contact Kristina Garabedian at (559) 970-1838 or kgarabedian@flypinfo.com. 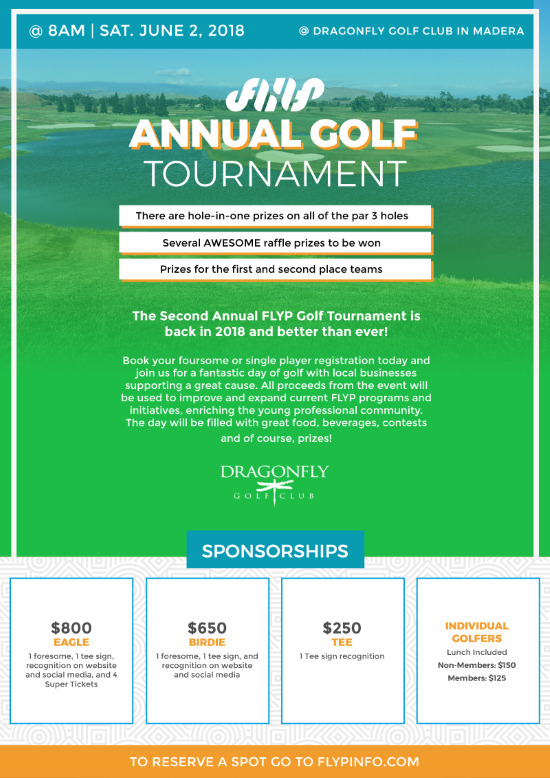 The Super Tickets includes: 2 Mulligans, 2 attempts at the Putting contest and a free round of golf at Dragonfly (with some restrictions)! Fresno’s Leading Young Professionals (FLYP) is a grass roots non-profit organization designed to keep and maintain young working professionals in the greater Fresno community. This is done through monthly mixers at businesses that are locally owned, professional development and community service events, and community leader luncheons. Fundraisers like this help us further our mission.